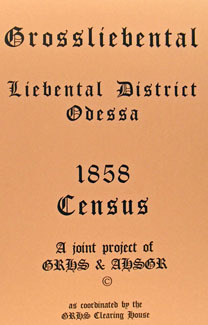 Liebental District Odessa, 1858 Census - a joint project of GRHS and AHSGR, 2001 . Soft Cover. The columns labeled 9th and 10th are the house numbers for the 9th and 10th censuses in 1850 and 1858, respectively.